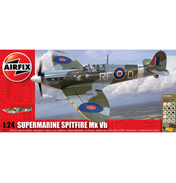 Here you will find a number of Airfix Gift Sets designed for use by the more experienced modeller, along with Airfix’s Themed Collection Sets. 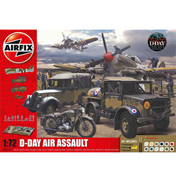 The Gift Sets fall into the following categories Airfix Car Gift Sets, Airfix Aircraft Gift Sets, and Airfix Ship Gift Sets. 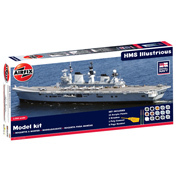 Airfix have a scale of easiness (or hardness depending which way you look at it!). 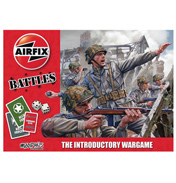 Skill level one is designed to suit a true beginner and skill level four is for the very confident Airfix modeller, with the levels in-between increasing in difficulty. 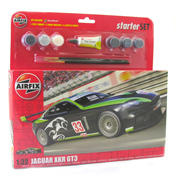 The more tricky kits may be because of the greater number of parts to fit, they may have more intricate parts, or the kit takes longer to put together or perhaps some more involved paintwork or decal work is required. Generally these kits are to suit skill 2 upwards and are not suited for new starters, but do not let us put you off if you want to jump in at the deep end, you will definitely still have fun. Examples of kits in this level 2 are the Airfix Dog Fighter Double Me110 & Spitfire MkIX which has a scale of 1:72 with 45/22 parts and the story is based on when the RAF fights it out against the Luftwaffe. The Titanic Gift Set, being the tragic White Star liner, is also level 2 and this one has a scale 1:700, together with 12 paints and 141 parts. Looking at Level 3 sets the F-18A Hornet 1:72 has 94 parts and is one of the USA Navy’s aircraft carriers and this one has 8 paints to enjoy. The Red Arrows Hawk Gift Set 1:48 is also Airfix 3 level with 128 parts and it too has 8 paints and is the most famous aerobatic flying team in the world and as such is extremely popular. The Then and Now Eurofighter Typhoon and Supermarine Spitfire scaled at 1:72 with 65 / 29 parts is also this level and demonstrates a classic fighter and modern fighter jet pitched against each other, as often they are seen at air shows. 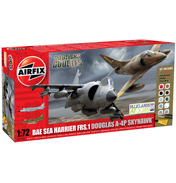 Or at the top end of the scale you could try the BAe Sea Harrier FRS1 Gift Set at a scale of 1:24 with 348 parts and certainly not for the faint hearted! 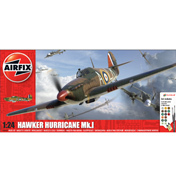 Some of these kits include a display stand such as the Airfix Dogfight Double Junkers Ju-88 and Hawker Hurricane MkIIb which means once complete you can make a display of the model in your bedroom, study or wherever else you can get away with it! All require painting in this range and the number of paints provided ranges between 8 to 12 and even higher, such as in the Cutty Sark model which has sixteen pots of acrylic paints all provided in the gift set. Discussing next the Themed Sets these generally take a special point in history, or a significant model and depict scenes there from. 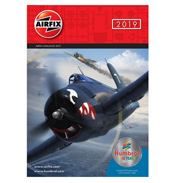 These make wonderful presents as many include an information booklet such as the Themed Duxford Collection which comes with an 8 page info leaflet on the Duxford airfield base history as well as 3 aircraft to model from that time and 14 paints. 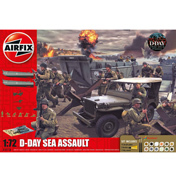 Other themed sets include Dambusters, the very famous RAF 617 Squadron who managed to destroy two dams during the Second World War, and is skill level 2, scale 1:72 and has125 parts and a display stand. Then you have the 100th Anniversary of Naval Aviation which celebrates this time and has 5 models from the era and 8 page booklet as well as the usual paint, brushes and cement. 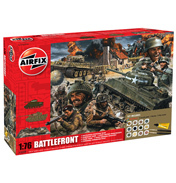 There is also the Battle Front Gift Set, a battle field scene with British and Germans circa 1944, with base, tank, troops, infantry and forward command post all in scale 1:76. (For information the Battle of Britain is included elsewhere due to its popularity and individual significance and popularity). Man’s expeditions to Space are also covered in the Themed Kits in the form of One Small Step for Man (Level 2) with Lunar Module ascent and descent stages to model and Apollo Saturn (Level 3) the largest launch vehicle ever, plus the Space Shuttle. Whatever your skill, and whatever your interest there is sure to be a suitable set here for you. 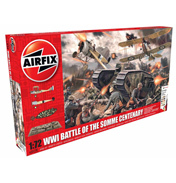 The Airfix Gift Sets make wonderful easy presents to buy to as you do not need to think about matching accessories or tools, as it is all there for you. Everything they need to achieve a perfect finish straight out of the box. 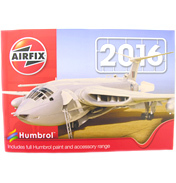 The Airfix Catalogue also makes a wonderful gift for the serious Airfix modeller.